Question: Could you please explain ayat 5:51? 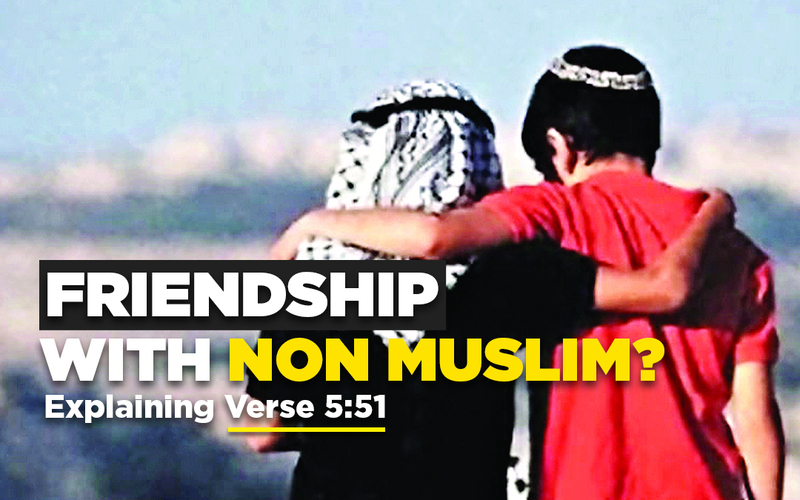 Does this verse mean that we cannot have non-Muslim friends? That would seem somewhat strange, because after all, men are allowed to marry non-Muslims. Why would we be able to marry them but not befriend them? This should set the tone for how we see verse 5:51, which has often been misused to claim that Islam orders Muslims not to have any sort of good relations with non-Muslims at all, an interpretation which is refuted by the above. 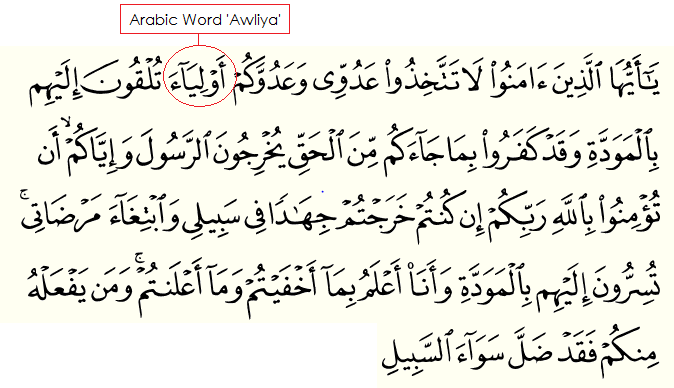 The verse in question contains the Arabic word Wali, the mistranslation of which to mean “friend” without any further qualification or nuance, is what has caused confusion here. Wali, in the Arabic language, has a wide set of meanings, none of which are used to simply mean “buddy, pal or acquaintance”, the way that we would use the term “friend” in modern times to denote our casual relationships with colleagues at work, peers at school or neighbors. In an everyday reading of the Qu’ran, after reading this question initially, I came across the word wali and its various derivatives multiple times; sometimes it meant “guardian”, other times, “discharger of affairs or executor”, or “protector and ally”, and even “inheritor”. “Friendship” can be included in this, but walaa’ is a type of intimate and extremely loyal bond that is not used for everyday friendships in Arabic. Allah calls Himself a wali of the believers and also calls Himself by its derivative, al-Maula, which roughly means “the Patron”. It gives a sense of one party standing protectively over the other, or fully backing and sponsoring them. Even when wali is translated without qualification as “friend” for humans, such as when one mentions a “wali of Allah” – may Allah Ta’ala make us amongst His awliya! – it implies a closeness between the Divine Master and slave such that absolutely nothing foreign is between them; the slave stands for everything the Master stands for, nor are they out of sync at all. So it becomes obvious from this analysis then, that the term wali here is not simply a “friend”, like the ones we make with the people we interact with each day in society. Next, we have to look at the verse in its proper context to see which meaning of the word is most appropriate for the translation of wali in this case to arrive at the correct interpretation. Different verses of the Qur’an were revealed by the Divine at different times in the Prophet Muhammad’s life (peace be upon him). Many times, verses answered questions or commented on specific historical events, some of which were intended to give a specific message to specific people only, and others, through those specific instructions, to give general guidelines to be used for future generations in various spheres of life. In interpreting the Qur’an then, it is vital to understand what was happening at the time of revelation that caused a particular verse to be sent down (these occasions are called asbaab al-nuzool in the science of Qur’anic exgesis). Many classical scholars of Qu’ranic exegesis (al-tafseer) have stated that this verse has up to three possible reasons for revelation. The one that most scholars seem to agree on is that, after the Muslims had been driven from their homes and persecuted for their faith by the Meccan pagans, they made their new homes in the city of Medina, where the Prophet (peace be upon him) established a constitution of mutual respect and religious tolerance with the People of the Book who already resided there. After the nascent Muslim community grew stronger and survived a critical test of existence with the Meccan pagans at the battle of Badr, it was brought to light that the political leaders of some of the non-Muslim tribes in Medina, their fellow citizens, had began to have talks with Meccan chiefs to violate their agreement of mutual protection with the Muslims and turn against them in the next confrontation they would have with the pagans. Many of the Muslims at the time, especially those originally from Medina, had strong bonds with people from the non-Muslim tribes dating back before their Islam. In the tribal customs of ancient Arabia where personal security rested on pacts and sponsors, this became a conflict of interest, where at one hand Muslims had individual alliances with individuals from the other groups, but on the other hand, their own community faced a serious internal existential threat from those same treacherous contacts. It was in loyalty to the community of the believers that one noble Companion, ‘Ubadah ibn Samit (may Allah be pleased with him), publically cancelled all of his personal alliances, while the leader of the hypocrites, Abdullah ibn Ubayy, who himself was not inwardly loyal to the Muslims but pretended to be one of them, declared that he would not cancel his alliances with people threatening his community, since if the Muslims ever lost to their enemies, his personal ties would save him from any persecution while his people could suffer. It was during this display of loyalty and reliance in Allah, versus a show of fickleness and hypocrisy, that Allah Most High revealed this verse. It was not due to the threatening group being Christian or Jewish in themselves that the prohibition came, as Muslims had far more enmity with Meccan pagans and the fact that the treacherous tribes were “People of the Book”, with a common God and shared spiritual history, actually allowed Muslims to feel closer to them and establish agreements and residence with them initially. However, groups in the past were divided clearly on the basis of religious affiliation, and so in accordance with the political reality at that time and place, the verse specified those two religions to denote the tribes who identified themselves as such. The verse also goes on to say that the people of those two groups always support and advocate for their own people, so the budding Muslim community should also support and advocate for each other rather than searching for help outside first. For brevity, we have sufficed with only one of the speculated reasons for revelation, because the others all revolve around similar scenarios (see tafseers of al-Baghawi, al-Shaukani, and al-Tabari for details). It is clear then, that the term wali should be translated as “protecting allies” in this specific case, and not to be left simply as “friend”, giving the impression that Muslims in the West should be isolationists who cannot have cordial relationships with the non-Muslims in their own societies. Rather, in light of the second verse quoted above, Muslims can and should make friendships with people who are positive towards them and supportive of their right and desire to follow their faith. Although some scholars reported a difference of opinion on whether this verse was only for that specific incident or a general guidance for all times (see al-Tabari and al-Baghawi), it has much relevance to Muslims in the West today, though not in the context of enmity or hostility towards any religious group. The verse encourages Muslims to support one another in establishing their communities without relying on others, and to advocate for their own rights and causes within civil society rather than having other religious groups, out of the goodness of their intention to help a minority community, do advocating for them, as it goes without saying that it will be according to other people’s religious views and that it wouldn’t allow for Muslims to develop community-building skills. It also tells Muslims not to take the patronage of other religious groups to work against other Muslim groups for worldly gains, and to prefer the benefit of the community over one’s own temporary benefits. So while one’s suhba, or close companionship, has the greatest effect on one’s own orientation and the majority and closest of one’s friends should be those who one will benefit from both in this life and the Hereafter, this does not preclude maintaining cordial and beneficial friendships with good people from other faiths. After all, how many amongst us have been guided to the light of Islam just through watching the beautiful conduct of a Muslim friend? Allah knows best, and all praises are to Him.